A great year for movies…Ralphie shot his eye out in “A Christmas Story“, Al Pacino became a gangster icon in “Scarface” & Tom Cruise dazzled us in his tighty-whities in “Risky Business“. The music released that year was unbelievable, with hit songs like “Come On Eileen“, “Little Red Corvette“, “Owner of a Lonely Heart” & “Mr. Roboto“. Many people were still just getting used to their stone-washed jeans, big hair, ray-ban sunglasses and a nightlife that didn’t include disco. The University of Georgia’s basketball team, however, was en route to the best finish in school history, finishing the season 24-10 and reaching the Final Four of the NCAA Men’s Basketball Tournament. The Dawgs were led by All-American guard Vern Fleming, All-SEC Center Terry Fair and coached by UGA icon Hugh Durham. In the Sweet Sixteen round of the tournament, Georgia was slated to play St. John’s University (a basketball powerhouse at the time). St. John’s was the #1 seed in the East Region and a heavy favorite to win the tournament. 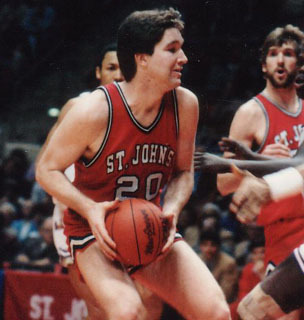 The Johnnies were led by Big East Player of the Year & NBA Hall of Famer, Chris Mullin. Terry Fair put on a sensational performance scoring 27 points and nabbing 9 rebounds while playing all 40 minutes of the game, leading the Dawgs to a 70-67 upset of the Red Storm. UGA went on to win two more games before losing a heart-breaker to NC State in the Final Four round of the tournament. Tomorrow night the 2009 versions of the Bulldogs and Red Storm will meet again in Madison Square Garden as part of the SEC/Big East Challenge. The game be shown on ESPN2 in the 7PM Prime Time slot. Was anyone reading the blog at the UGA/St. John’s game in 1983? Or watching on TV? I was only 3+ years old at the time so I didn’t get to watch it myself, but I would love to hear any comments about the game from someone who saw it live. Fantastic job so far. Just got notified about the blog today and read all your posts. Solid work, it’s nice to have some UGA Basketball stuff to read. Keep it up. Thanks Justin. I appreciate the comment. Hopefully the Dawgs can pull an upset tomorrow night in NY.